In the pursuit of higher efficiency in our homes, there are two elements that need to be controlled: insulation and airtightness. Building Regulations currently requires an airtightness of 5m3/m2/[email protected], which is approximately half an air change per hour, and as the airtightness improves, so does the requirement for controlled ventilation in order to maintain a healthy environment without the needless loss of too much heat. There are a number of ways to introduce ventilation regimes to the home and each has specific features and benefits. But how do you choose? The simplest method is to build airbricks and window trickle vents into the fabric of the building. This is, however, fairly uncontrolled and air change rates can be affected by the prevailing wind speed and wind direction, furniture or curtains blocking the holes, and/or the position of the vents not facilitating good circulation through all corners of the property. You can still end up with condensation on the windows and forming as patches on the walls. The most controllable ventilation systems are ‘active’ with fans to create either positive or negative pressure in the home. Often carefully designed ductwork is used to balance the system across the building. The running costs of MVHR units are difficult to accurately predict as the running load of the fans is affected by the volume of the house and the resistance of the ductwork, as well as the summer running regime. As an example, a 200m2 house would have a volume of around 480m3 so at half an air change per hour we would look at a flow rate of around 240m3 per hour. At a cost of 12p/kW for electricity we would expect an annual running cost of between $200 and $300. With improved fan efficiency and good ducting design these costs could be reduced. Whole house mechanical ventilation with heat recovery (MVHR) consists of two independent ducted airflows, each with its own fan. The extract fan extracts the stale humid air from the wet rooms (bathrooms, kitchen, utility, etc.) and passes it over a heat exchange matrix – where it recovers around 80 per cent of the heat from the stale air – before discharging it to the outside. The second fan draws fresh air from outside, filters it to get rid of pollution and airborne allergens, then passes it over the heat exchange matrix in order to supply pre-warmed fresh air to all the living areas and bedrooms. Any ducting that passes through ‘cold’ spaces (like a cold roof loft) will need to be insulated to optimise the efficiency of the system. 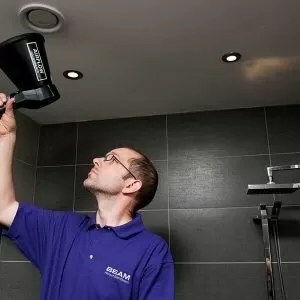 By targeting home ventilation in this way, much of the moisture and odours generated in the house are extracted directly at the source, with little spread to other rooms. Good indoor air quality is achieved with less ventilation when compared with other methods that rely on open windows and uncontrolled vents in the walls and window frames. Furthermore, with uncontrolled ventilation, moist air and odours are spread around the home, often condensing in, or on, the fabric of the building. This can cause health issues through humidity, such as dust mites and mould, or even impact on the long-term integrity of the building materials. A heat pump with mechanical ventilation heat recovery (MVHR) unit is an advanced form of technology. The unit provides whole house heat recovery ventilation in exactly the same way as the standard MVHR unit, but with the additional benefits of comfort heating or cooling. The heat pump element is designed to operate when the home requires additional heating or cooling. The heat is extracted from the exhaust air just before it is discharged to outside and transferred to the air supply as it enters the ductwork. This results in the air supply being significantly warmer than the normal room temperature. It is therefore a net supplier of heat and can therefore complement the primary heating system, reducing energy bills. During summer the unit can provide pre-cooled, dehumidified air — thus increasing comfort levels while retaining the quality of the indoor air. With this system, all ducts must be insulated to avoid heat loss when the unit is in heating mode and prevent condensation when cooling. When considering MVHR it is prudent to still design in primary heating to meet the heat loss in all rooms with extract terminals. Rooms with supply terminals can benefit from a reduced requirement for primary heat and therefore potentially require smaller emitters. The primary heat is there to maintain zoned comfort levels as well as having the capacity to ‘reheat’ the property after a period of outing such as a holiday or power failure. In high-performance homes such as those built to Passivhaus standard, Code for Sustainable Homes Level 5/6 or any other aspirational high-performance construction methods, it may be enough to add small in-line duct heaters. These can be simple electric heaters or ‘wet’ units that are plumbed back to a boiler and supply heat in the same way that they would to conventional radiators. Careful attention needs to be given to the heat requirement of the room and the airflow as you do not want to raise the air temperature above around 50°C and therefore the heating capacity will be limited by the amount of air delivered to that room. This is always going to be low-level heating and it will also be divided into all the supply rooms according to the flow balance without any zone control. 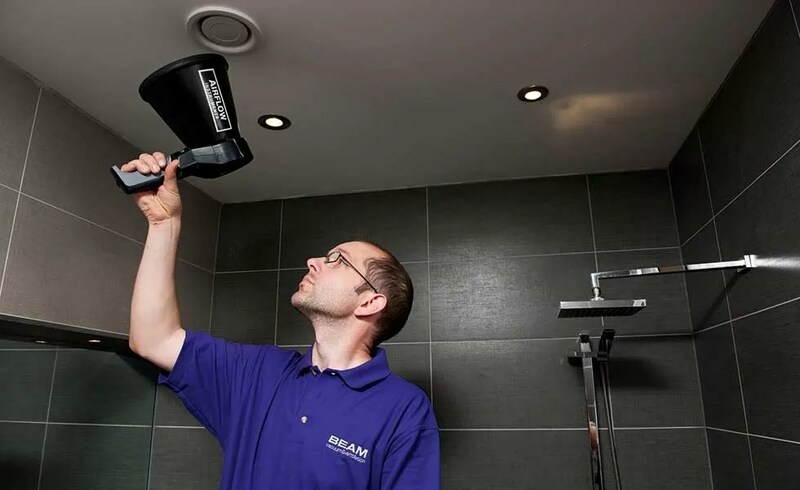 Attention needs to be given to the ducting specification as many products are not capable of carrying heat and the ducts will also need to be insulated for efficiency, which takes up more space. Terminal heaters that replace the room terminal are also available for targeted heat in single locations. These are in-line electric heaters so wiring would need to be supplied to the terminal location and a room thermostat also installed to control it. The controller should ideally be more than just a simple ‘on/off’ switch. 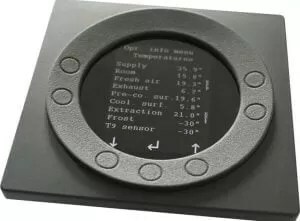 It should allow the connection of a remote boost switch (in case you burn the toast and need to purge the kitchen) and have real time information on the temperatures of the air coming in and out of the unit, as well as automatic summer bypass function that automatically directs the air flow past the heat exchange matrix when the outside temperature is warm. The automatic bypass is more important at the beginning of the cold season as you do not want to be blowing cold air directly into the home. PIV is primarily for existing homes with a loft space. The concept is based on the assumption that the loft space is around 7-10°C warmer than the room temperature. 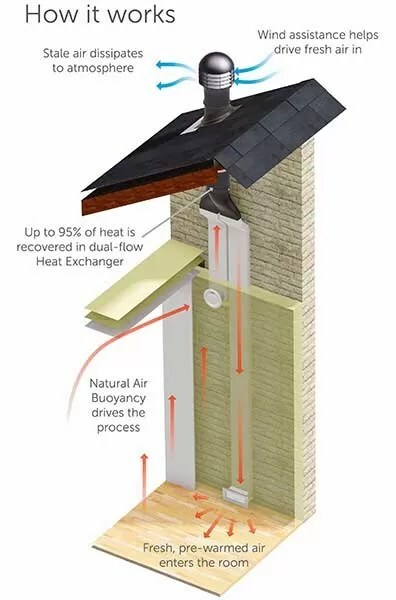 A central unit draws the warm air from either the loft or outside, filters it, and delivers it into the property, thus creating a positive pressure which forces the stale air out. Manufacturers also claim that the positive pressure is a combatant against damp. MEV is almost the opposite of PIV and is effectively a centrally situated fan that draws air out of the property creating a negative pressure, which theoretically draws fresh air evenly into the property through the envelope of the building. Design of the system and the building envelope is critical with both of these systems to ensure an even flow of air and to avoid any blank spots in the property. There are passive ventilation options that rely on prevailing wind or natural buoyancy rather than active fans to move the air, and offer better air movement and efficiency than trickle vents and airbricks. Warm air rises and by installing carefully designed extract vents at high level in the room it is possible to use this natural buoyancy to create an upward movement of warm, stale air and have a fresh air inlet at low level that can be either purpose-built ductwork or use an existing chimney breast. The incoming fresh air passes through a special heat exchanger to recover heat from the extracted air in a similar way to the active heat recovery systems. Prevailing wind systems have bespoke ‘split chimneys’ that are installed in exposed areas such as on the roof. One side of the chimney lets air into the property and the opposite side draws it out. The positive pressure of the prevailing wind on the windward side pushes the air into the property and the negative pressure of the leeward side creates the extract. There is a heat exchanger to recover heat and there are dampers in the system to prevent over-ventilation, but in the absence of wind the system will have to rely on natural buoyancy alone.